The New Braunfels Public Library prides itself on its collaborative efforts between various groups and organizations. NBPL has built and maintained community partnerships and a team of volunteers and continues to do outreach work, help practicum students, and to be actively involved with our Friends of the Library and NBPL Foundation. Volunteers: The library hosts about 40-60 volunteers at any given time. The NBPL volunteers assist with checking in and shelving materials; processing books, CDs, DVDs, and other materials in preparation for cataloging; assisting with library programs; delivering books to homebound patrons; and assisting in distribution of food during our twice-monthly mobile food pantry at our satellite location, the Westside Community Center. Teen Volunteers: NBPL hosts a large number of young adult volunteers who are seeking to earn National Junior Honor Society and National Honor Society credit. The library holds “Teen & Tween Drop-In Volunteer Hours,” twice a month to give students and other young adults the opportunity to gain service hours by helping shelve materials, putting book carts in order, and helping librarians assemble supplies for programs. School Programs and Visits: The Youth Services Department gives a presentation at 13 local schools to promote our Summer Reading Program in May. The RIOmobile makes several stops (in addition to regularly scheduled weekly stops) around the city to promote our library. Practicum Students: Each year we answer school questions for approximately 3-7 library science students either in person, via email, or by phone. There are currently four library science students employed at NBPL, and all have plans to complete their practicum at this locations. McKenna Children's Museum: The library and McKenna Children's Museum partnership began last year and is still going strong. Both organizations conduct integrated programs at the other location once per month. NBPL focuses on early literacy which correlates with McKenna's "Book of the Month," while McKenna correlates STEAM activities with the library's storytimes. 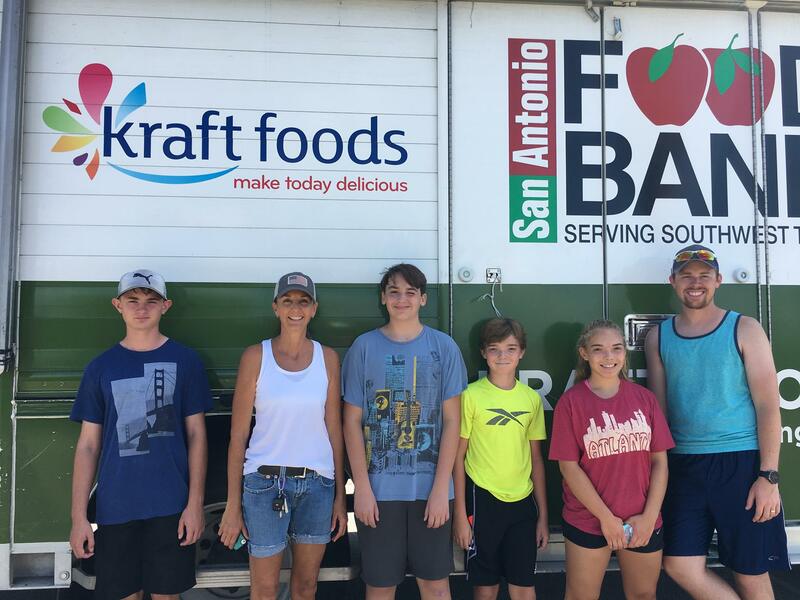 San Antonio Food Bank and Mobile Pantry: The largest community partnership the library has is with the San Antonio Food Bank (SAFB). Food pantry vouchers are distributed at the library and Westside Community Center. 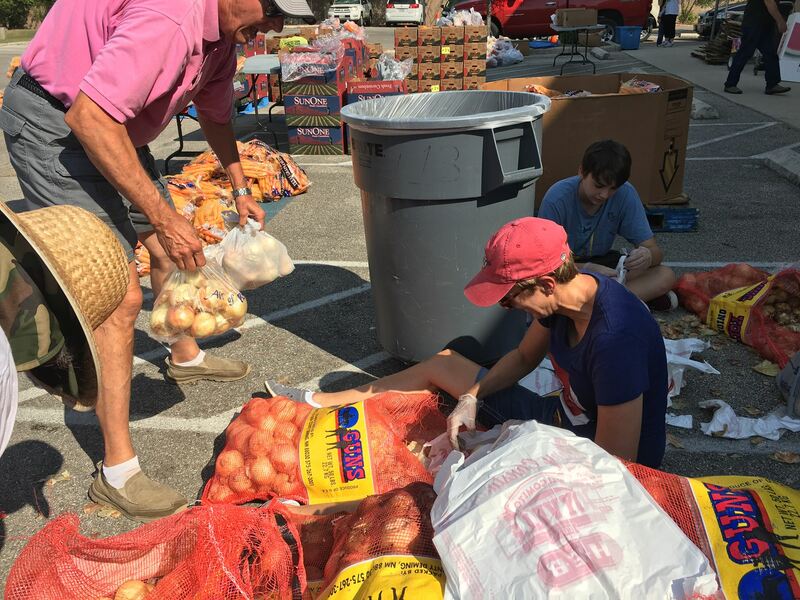 Volunteers are given the opportunity to help distribute food to approximately 180 families. During the food distribution, volunteers are also able to communicate other outreach activities that are offered by the library. Head Start Program: The library's partnership with the New Braunfels ISD's Head Start program allows NBPL to reach approximately 325-340 preschool students in the Comal County area. The library visits this location once a month and brings programming to these students. Programming typically consists of a storytime and an extension activity. Also, through the BCFS (Baptist Child & Family Services, the organization that received the grant to lead the Head Start program in the county) the library helps with interactive workshops for parents. Das Rec: This year NBPL teamed up with the city's new recreational center, Das Rec, by added a book kiosk and drop off. This kiosk acts as a book vending machine so patrons can use their library cards to check out items from the kiosk or login to use our digital resources. NB Humane Society: This year NBPL partnered with the NB Humane Society to help cats find their forever homes. The library hosted a "Check Out a Cat For Life" event where patrons could come play with the cats up for adoption, foster a cat, or adopt one themselves! We even had a few librarians adopt a few of these cats. 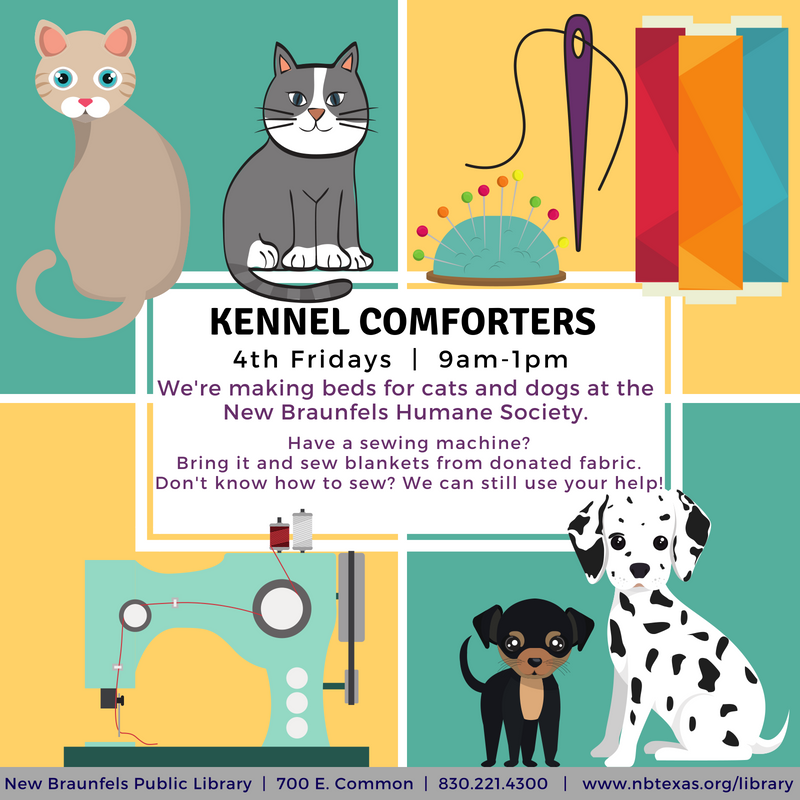 NBPL also introduced a new program called "Kennel Comforters," where HSNBA provided supplies and sewing machines for anyone to stop in and help create dog and cat beds for the animals at the shelter. Other City Department Partnerships: The City of New Braunfels implements an extensive recycling program that all departments contribute to. NBPL participates by offering free yard recycling bags to patrons and providing trash and recycling receptacles that organize discarded items by glass, paper, Styrofoam, and general waste. The NB Impact Committee began this year, and we have two staff members on the committee representing the library. 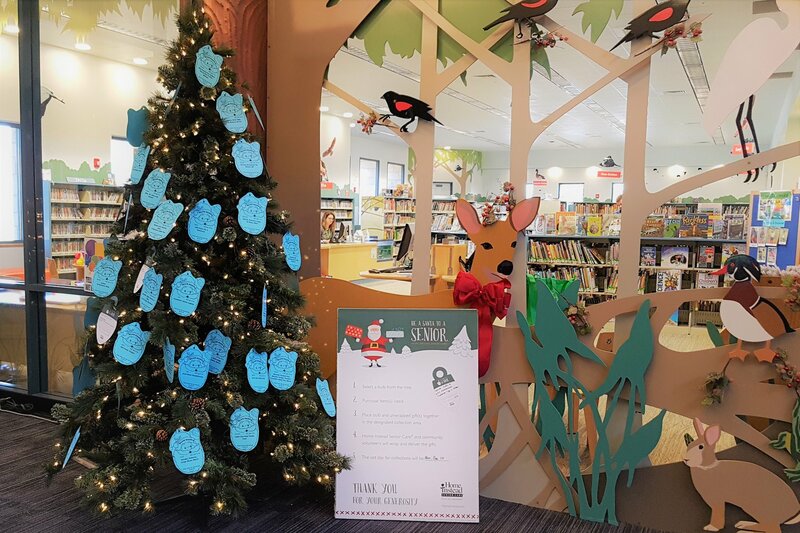 Friends of the Library and the NBPL Foundation: The library constantly collaborates with the Friends of the Library (FOL) and the NBPL Foundation. 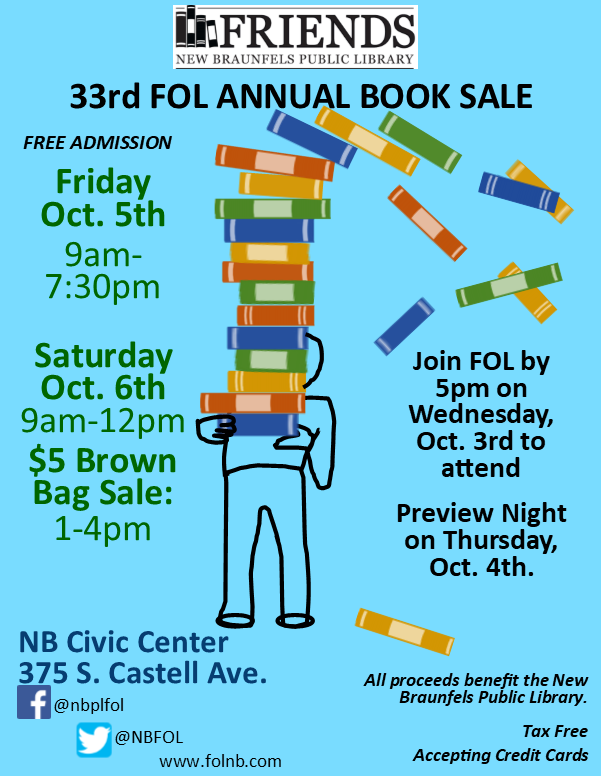 Many of our staff serve on the Foundation board and other staff often work closely with the FOL for their annual book sale. The Foundation hosts an annual "Book and Author Luncheon" and "Stay at Home Book Ball" to help raise money for the library. Each holiday season, NPBL teams up with local organizations to offer patrons the chance to participate in Blue Santa and Be a Santa to a Senior. Here are some action shots from our Mobile Food Pantry at the Westside Community Center featuring Outreach Librarian Jennifer Hernandez!